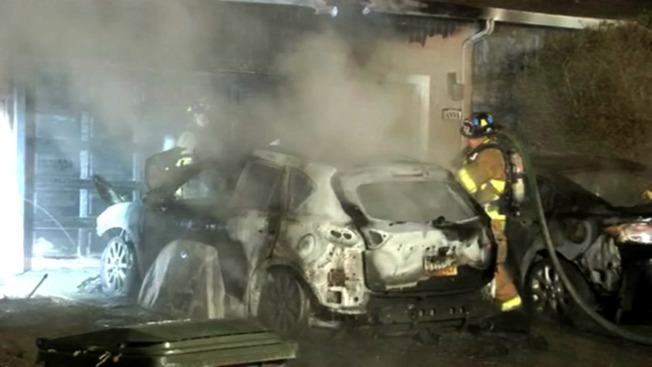 Firefighters in Martinez on Sunday were investigating what triggered a car parked on a driveway to catch fire and subsequently ignite a neighboring vehicle and garage. Investigators were calling the fire "suspicious" but declined to provide any details. They said more information would be available when the investigation is complete. Neighbor Antony Poppy said he heard a "huge bang" before spotting flames shooting out of one of the car's parked in front of a home's garage. "I was taking my dog outside and the bang was crazy loud," he said. "Loudest bang I've ever head, for sure." Within roughly five minutes, "the car was enguled with massive flames," according to Poppy. Those flames then spread to an adjacent car parked on the driveway and to a portion of the house's garage, Contra Costra Fire Batallion Chief Dominic Ciotola said. Responding firefighters were able to douse the fires in roughly 10 to 20 minutes, according to Ciotola. Residents located above the garage were able to escape the home on their own, Ciotola said. A neighbor alerted them to the flames initially. Jin Kim, who lives next door said he told his neighbor, "Your house is on fire." "We called them out, and they stayed in our house for a while," Kim said. As for what caused the explosion, Ciotola guessed it was probably car tires or other car parts, but he wasn't completely certain. "It's hard to tell," he said. An investigation into the explosion and fires is ongoing.